Robbie is an eleven year old Cairn Terrier who is in need of a new home. Details about Robbie are on the Current Rescue Dogs page. Cairn Terrier Rescue UK shared a post. 9th March - 3 year old Aaron a Cairn X is with Many Tears LLanelli, Wales. He is NOT with our CTRF rescue, we are sharing him to widen his audience. Please follow the link below to find out more about him. I thought that all of our followers and friends of Cairn Rescue would like to see where Chris Hewitt (CTRF Chair/Trustee), and myself Chris Roberts CTRF Secretary/Trustee) were on the 2nd April, and more importantly who we met. We had both been invited to attend a champagne reception at the Kennel Club, London, and were to be presented to H.R.H. The Princess Royal. What an honour, especially as the CTRF is celebrating its 50th year, also I will be retiring as Secretary at the end of the year, so it really was the icing on the cake. What a fabulous day we had. There were approximately 70 guests, and the Princess Royal took time to shake hands, and speak to everyone. As you can see, as usual, I was my normal quiet self!!! NOT. Cairn Terrier Rescue UK shared a link. Wendy Laker's fundraising page on Everyclick. 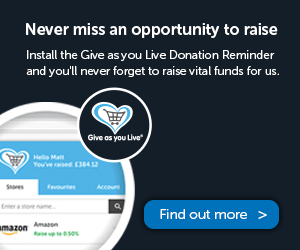 Donate to charity and raise money online by Give As You Live! 8th April - Kindles a 4 year old Cairn is in need of a new home. she is with Many Tears Rescue in Llanelli Wales. Please follow the link below for more information.